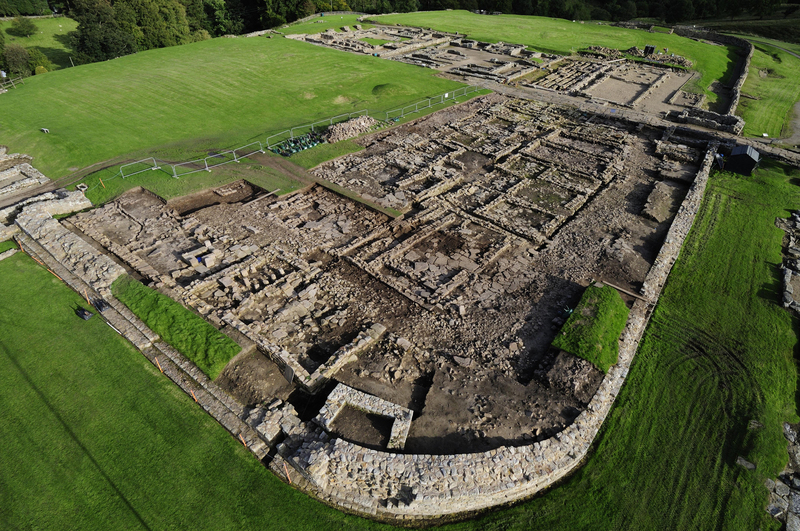 Vindolanda, a Roman auxiliary fort in Northumberland just south of Hadrian’s Wall, is a huge motherlode of archaeological discoveries, with its nine rebuilds, related civilian communities and near continuous use from 85 A.D. until the 9th century. Most famously, the anoxic waterlogged ground has preserved an unprecedented collection of correspondence written in ink on thin postcard-sized pieces of wood in a cursive Latin. More than 700 have been recovered and transcribed (see the full collection including high resolution pictures on the Vindolanda Tablets Online database). 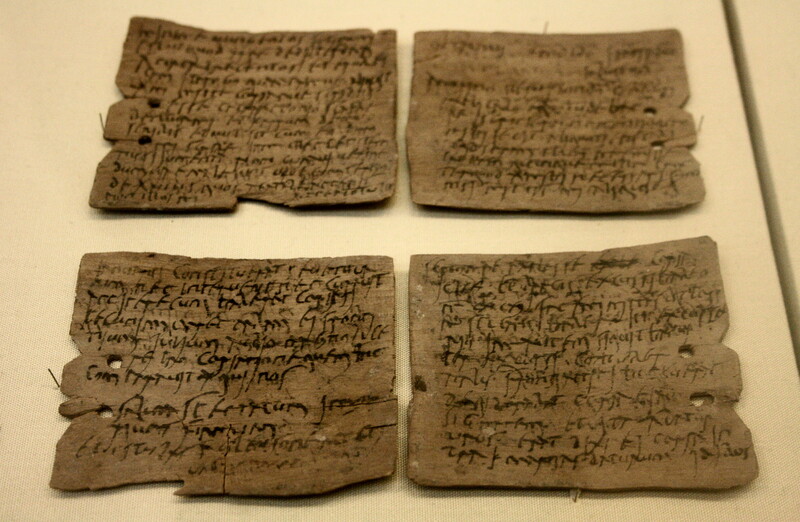 The Vindolanda tablets are the oldest surviving handwritten documents in Britain and a remarkable primary source of information about life at the northern border Roman Britain before and after the construction of Hadrian’s Wall. The site has been excavated regularly since 1970. The first tablets were found in 1973 and every year new discoveries are made. 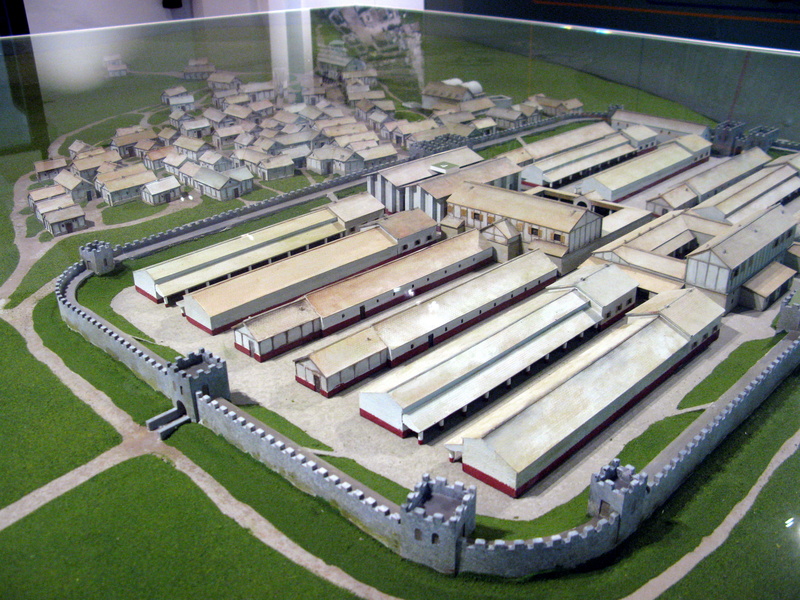 The Vindolanda fort has produced the greatest collection of Roman footwear anywhere in the Roman Empire, delicate textiles, altars, brooches, rings, gaming pieces, extensive structures including two bathhouses, one before Hadrian, one after, temples, a granary, officer’s houses and soldier barracks. Thousands of coins have been unearthed by professional archaeologists and by the more than 6,400 volunteers who have dug alongside them since 1970. None of them, however, have been gold. Until now. 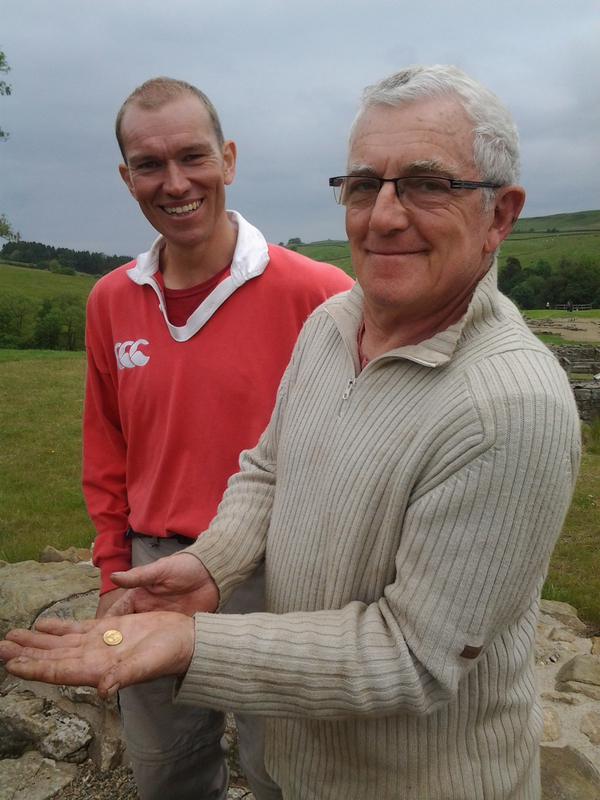 On June 3rd, 2014, the first gold coin at Vindolanda was found by a French volunteer. The well worn coin was soon confirmed by the archaeologists as an aureus (gold coin) which although found in the late 4th century level at Vindolanda bears the image of the Emperor Nero which dates the coin to AD 64-65. This precious currency, equating to over half a years’ salary for a serving soldier, had been in circulation for more than 300 years before being lost on this most northern outpost of the Roman Empire. The coin features the laureate head of Nero in right profile with the inscription “NERO CAESAR” on the obverse. On the reverse is an image of Nero standing radiate, holding a branch and a globe on which stands a small figure of Victory. 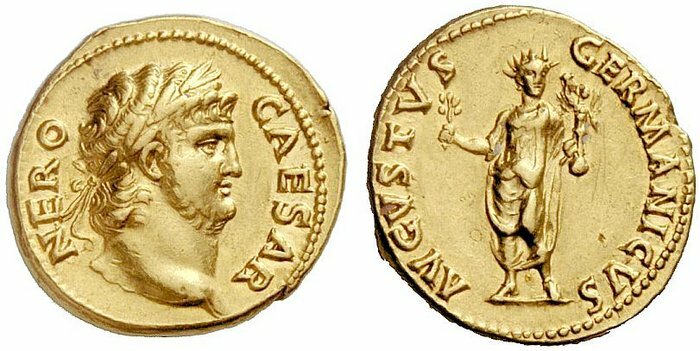 It bears the legend “AVGVSTVS GERMANICVS.” Nero had these aurei issued in the wake of his monetary reform of 64 A.D. To make a dollar out of fifteen cents, Nero reduced the weight of the gold in the coins so he could mint more with less. Silver coins fared worse, being not just shortweighted but also less pure. Bronze, copper and brass coins he cranked out in vast quantities. Nero was the first emperor to debase the coinage, but he wouldn’t be the last. You can tell from its condition that the aureus went through a great many hands in its long life as legal tender. It was unearthed at the fort itself, not in the village that grew next to it. Gold coins are very rare in Roman military sites. They were just far beyond the level of currency exchanged in military outposts. Chances are, this is the only aureus that will ever be found at Vindolanda. The coin will be studied in greater detail, along with the panoply of other artifacts discovered during this season’s dig (April 7th – September 19th). Once it has been researched and documented, the aureus will likely go on display at the site’s Roman Army Museum. This entry was posted on Thursday, June 19th, 2014 at 10:02 PM	and is filed under Ancient, Treasures. You can follow any responses to this entry through the RSS 2.0 feed. You can skip to the end and leave a response. Pinging is currently not allowed. Kings and emperors tend to get a bad rap for debasing their coins, yet frequently it was the right thing to do. There was a widespread practice of shaving the sides of coins. A coin that remained in circulation for a long time would have a nominal value considerably higher than it’s actual value. So if a ruler kept issuing new coins with an unchanging precious metals content, then newly minted coins would be hoarded and old ones used for trading. An added complication was foreign trade, as merchants would exploit any arbitrage opportunities, such that there was a risk of precious metals flowing out of the country. For this reason rulers would periodically lower the precious metals content in their coins. In England it was a once-in-a-generation event, occurring roughly every 25 years.